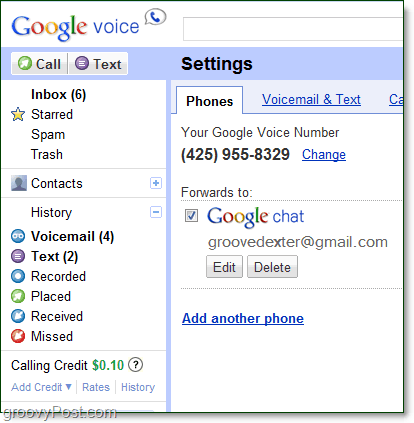 By now everyone should know that Google Voice has gone public and ANYONE can get an account. Now with the latest upgrade, Google Voice has become a true Skype killer, land-line slayer, VOIP provider, and a threat to cell phone carrier’s minute planes. Why? Because you can make free phone calls anywhere in the United States and Canada using just your computer and an internet connection, no phone required. If you are not entirely sure what this all means, Google has created a comical video to help explain things. 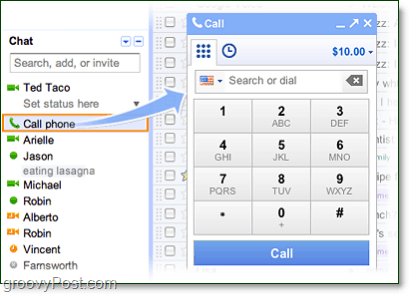 After you’ve installed the plug-in a “Call phone” button will appear on the left Gmail sidebar, it is located under Chat. When you Click the button a phone dialog will appear just like the one you see in Google Voice mobile. Type in the number or Google Contact name and call away! Again, all calls in the United States AND Canada are completely free! Conference calls are still at a 4 person max, but they DO work with Gmail! Don’t have a phone handy? Or maybe it is just easier to receive the calls on your computer. Either way, if you have the plug-in installed you can answer calls from your internet browser, just make sure a Gmail window is open. But, before you will receive calls to your Gmail, you first must set up call forwarding. This is done in the Google Voice settings. On the Phones tab of Google Voice settings you’ll find the option to forward calls to Google Chat. Just Check the box next to Google Chat above your Gmail address and then you are done. Once you have forwarding set up, if you receive a call on your Google Voice number it will now ring all of the devices you have checked and ALSO your Gmail window. A small pop-up will appear on-top of your emails. You’ll be given three options: Answer, Screen, or Ignore the call. Answer and Ignore are pretty obvious, but the Screen option is rather groovy. Here you can listen as your caller leaves you a voice message. If at any time you want to jump in and start talking, Click Join. If tired of listening to them, you can also Hang Up. Once your caller is done leaving a message, you’ll be given two options. To Mark As Read press 7 on your keyboard. To keep it Unread, press 9. Gmail Texting From Your Google Voice Number, Possibly In The Future? Google hasn’t yet integrated Google Voice’s texting features into Gmail, at least, not that we could tell. In the same chat pane of Gmail you have the option to call or to Send SMS. While it’s true you can send SMS to almost any mobile from Gmail, it doesn’t give the recipient your Google Voice number. In fact it doesn’t even give the recipient a reliable static reply number, instead they just see a temporary one. Earlier today me and MrGroove were testing out this new Google Voice-Gmail feature. It sounds great, voice quality couldn’t have been better. I called his cell phone from my laptop, he called my laptop from his cellphone, I called his MacBook from my desktop… etc. It works! The only catch so far is that all calls are handled by Gmail and so you must have an internet browser opened up with the same Gmail account that is connected to your Google Voice account signed in. I wouldn’t call this a real threat to mobile carriers yet, but if in the near future we get the same functionality as the Gmail voice feature on Android phones… that’s big. You won’t need “minutes” on your cell phone plan anymore, just Data. This is making me rethink buying a new cell phone! Like you said, if Android phones get this kind of app all I will need is a data plan. Google Voice has become a “virtual phone.” Too bad it doesn’t work on the iPad. I tested it last night on my iPad….. Because you need to the Voice/Video plugin from Google it wouldn’t work like you said. Once this becomes fully HTML5 however it will probably work from any browser device including the iPad / iPhone! Can’t wait. Ha, I was all angry because I thought Google had skipped over me for this feature, but it turns out that I had my language set to English UK in order to fix a previous quirk from years ago. I changed it back to US and now the Calls feature appeared! This is crazy, just called my uncle in California for free from my laptop. Is it possible to switch an existing phone number over to Google Voice? Or vice versa. Google has promised this feature… in 2009. Yet they still haven’t delivered it. Just called everyone I had been putting up, just because it’s 30 times more convenient to make calls from my laptop. It’s free for using GV on your computer but it’s not really free from using it on your cell phone. your cell phone carriers still charge you for mins and texts you use. you want to try? cancel your test message service and get the lowest min plan from your cell phone carrier, try to text and call over your mins, see what happened! You are totally right about the minute plans. Since Google Voice calls your phone all it is really good for is keeping your number private and transcribed voicemail. But, there is a work around on Android using SIP VOIP that I’ll be posting soon though. Regarding text messages, if you text using Google Voice you can do so without a text messaging plan. All text messages sent through Google Voice are considered DATA and so your carrier really has no idea you are even sending them, it just looks like internet browsing to them. Thanks for the message. but please i would like to know, is it only free to call in US and canada, how about the rest of the world? please make it free worldwide. thanks again.